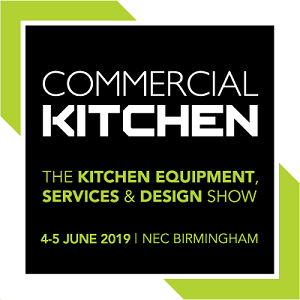 Commercial Kitchen – the UK’s leading kitchen equipment, services and design show, taking place at the NEC Birmingham on 4-5 June, will feature even more new innovations and solutions designed to help foodservice equipment buyers and caterers make their kitchens greener, says event organiser Diversified Communications UK. With visitor registration now open, this year’s attendees – who annually include key decision makers from all types and sizes of kitchens (from Michelin-starred restaurants to local pubs and bars, from casual dining chains to fast food outlets, leisure venues, work canteens, schools and hospitals) – will also benefit from a wealth of expert advice on managing sustainable back-of-house protocols and increasing their resource efficiency via a series of dedicated Keynote sessions. The Soil Association’s new Green Kitchen Standard, which recognises and promotes caterers’ environmental credentials, will also be supporting and exhibiting at the show for the first time. While The Sustainable Restaurant Association will return as a show supporter (ceda and the FCSI – the show’s lead partner and partner respectively, have also already been confirmed). Kitchen equipment wish-lists for the year ahead will, of course, vary from business to business. According to Matthew Merritt-Harrison, new chair of the FCSI UK and Ireland and managing partner of Merritt-Harrison Catering Consultancy (and a speaker at last year’s show), it’s important to focus on ‘energy-efficient equipment that is cost effective and sustainable over its life cycle’. It won’t always mean taking the lowest cost options, but the ‘best value’ in the long run. Particularly when considering new warewashing, combination ovens, induction cooking and refrigeration equipment, he says1. Switching to more efficient appliances can offer multiple benefits, aside from alleviating rising energy costs, it can reduce consumption, waste and carbon footprint – and save valuable staff time. When identifying key trends for commercial kitchens in the coming year, Tyron Stephens-Smith, project & creative director at design and install firm TAG UKltd, said he’d also seen more ‘operators evaluating ecological equipment offers and efficiencies to combat the rising costs of staffing’2. 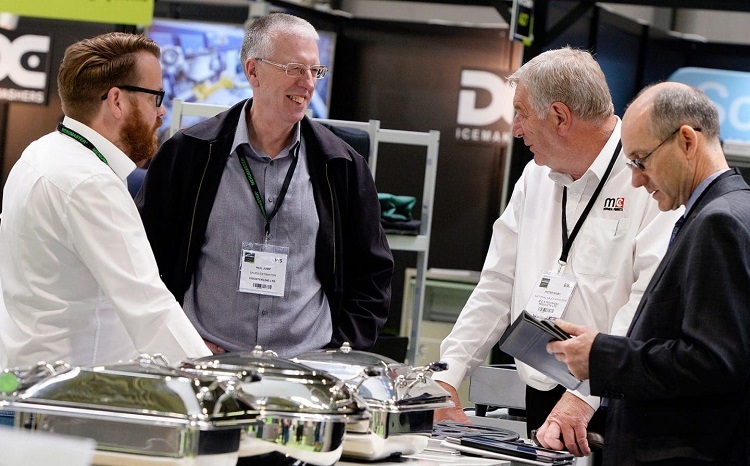 Whatever a business’ requirements or needs, Commercial Kitchen’s 100+ exhibitors will have it covered. Cuisinequip/Valentine Equipment, DC Warewashing & Icemaking Systems, Gamble Foodservice Solutions, Hupfer/Trak, Jestic Foodservice Equipment, Meiko UK, Precision Refrigeration, Regale Microwave Ovens, Synergy Grill, Target Catering Equipment, and Wexiödisk, are just some of this year’s exhibitors promoting their latest energy-efficient/sustainable models and systems. Jestic Foodservice Equipment is showcasing the latest in sustainable frying technology from Henny Penny. The revolutionary Evolution Elite open fryers use up to 40% less oil, deliver ongoing efficiencies and labour savings, and use state-of-the-art technology to guarantee consistency and reduce waste. Hupfer’s ThermaDry uses modern heating technology with low power consumption, utilising infrared heating lamps over traditional heating coils. With integrated ceramic plates for dry heating and a newly-developed gantry, the ThermaDry is the ultimate energy efficient hot holding drop-in unit. Gamble Foodservice Solutions is the UK distributor of FWE’s range of cook and hold ovens, which are among the most versatile on the market. They’ll be introducing the compact countertop LCHR-1220-4. This plug and play oven runs from a 13 amp plug, with lower wattage elements that will save money in electricity. Target Catering Equipment is demonstrating its award-winning, energy saving TR-E+ induction range, which incorporates four square zone induction hobs, induction griddle and convection oven. It’s a versatile stove, which suits various cooking styles including multiple pan cooking, direct plancha cooking and large single pan cooking. Thanks to the latest patented burner technology and natural ceramics, Synergy Grills (like the SG900 for example) use on average 59% less gas and produce less carbon monoxide residue compared to commercial gas grills of similar sizes. The heat capturing ceramic technology ensures that heat is focused directly towards the food, therefore requiring less energy for a cleaner, safer and greener grilling experience. Wexiödisk is showcasing its remarkably efficient, award-winning, green WD-6 Duplus and WD-PRM6 single-hood concept. Featuring a world first, double-rinse sequence, the pre-rinse and wash technology uses just 1-litre of fresh water per cycle, significantly reducing water, electricity, and chemical consumption, yet delivering consistently outstanding results. The rapid heat-up and energy efficiency of HWM induction hobs from Cuisinequip are ideal for operations where adaptable cooking systems with low residual heat and a small footprint are needed (Robin Hill Country Park in the Isle of Wight is a recent example). They save energy by heating just the pan when it’s in contact with the hob. Meiko UK’s M-iClean H is the first truly ergonomic pass-through dishwasher, with astounding economic performance including up to 21% energy-savings compared to previous Meiko hood machines. Water consumption is also minimised thanks to smaller 2.4 litre final rinse, compared to 3 litres per rack on older Meiko machines. Precision Refrigeration’s most popular and energy efficient product at this year’s Commercial Kitchen show is the A energy rated MCU211 GN1/1 counter. Used by chefs across the world, the MCU211 features: durable stainless steel interior and exterior, R290 hydrocarbon refrigerant, and 60mm zero ODP insulation. Regale Microwave Ovens is promoting the Panasonic NE 1878 complete with new Microsave CPS3A Cavity Liner. The saving of 6.3% on power use makes it one of the most environment-friendly, heavy-duty microwave ovens on the market, while the cavity liner made specially for this model will save the ceiling plate (roof liner), ceramic glass base plate, and the lens light cover. DC Warewashing & Icemaking Systems’ Optima Double-hood Passthrough Dishwasher – OD1450AD, is capable of washing 1,400 plates an hour (or up to 120 baskets) and comes with energy saving stand-by mode and an auto-On/Off features. When fitted with the new DC Steam Heat Recovery System it can reduce energy use by up to 25%, plus because it removes the steam generated by the wash cycle there’s no need to install a separate extraction canopy or condense hood. Professionally reconditioned equipment is another option for operators on a tight budget (and it also helps reduce landfill waste). Returning exhibitors offering this service include Caterquip UK and General Catering. 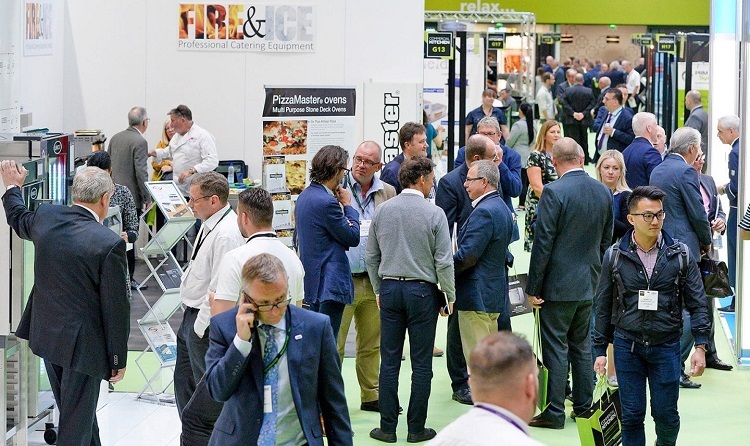 While for operators looking for new eco-friendly ways to manage their food waste, there’s PRM Waste (which launched its PRM Bio-Processor at Commercial Kitchen 2018) and EXBIO, with its popular Ex Series digester. Last year’s attendees included buyers from Amazon, Bartlett Mitchell, Bourne Leisure, Brewhouse and Kitchen, Burger King, Casual Dining Group, Costco Wholesale, Deliveroo, Drake and Morgan, EI Group, Empire Cinemas, Everyman Cinema, Fuller’s, Greene King, Hall & Woodhouse, Jolly Fine Pub Group, Kew Green Hotels, La Tasca, Las Iguanas, Marston’s, Mitchells & Butlers, PizzaExpress, Pizza Hut International, Punch Taverns, Sainsbury’s, SSP, Tesco, TGI Fridays, The Bath Pub Company, The Fat Duck, Tortilla, Virgin Trains, and Whitbread. Plus a record turnout from all the key project houses, distributors and installers, including Airedale Group, Brakes Catering Equipment, C&C Catering Equipment, Catering Design Group, Catering Equipment Solutions (Peterborough), CHR Equipment, Court Catering Equipment, Gratte Brothers, Inox Equip, KCM Catering Equipment, Kitchen & Restaurant Projects, Nisbets, Sprint Group, TAG Catering Equipment, and YCE Catering Equipment alongside many other leading ceda members. “Commercial Kitchen is the best place to source and test the things that make our kitchens work even better,” says Martyn Clover, head of food at Tortilla. “We’re constantly looking for the best kit for our kitchens and there is no better place to find it than at Commercial Kitchen,” says Tom Mullin, executive chef at Pizza Pilgrims.